Galerie Ren (ギャルリ蓮) is a Kaleidoscopes shop and stone bracelet shop. It is located nearby Zenkoji Temple, Nagano Prefecture. 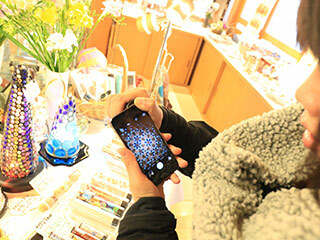 There are many collections of kaleidoscopes and accessories. You can try to make your own kaleidoscope at this shop. You can pick up decorations to creat your own favorite design of kaleidoscope. It takes about 1 hour. There is no parking. There is restroom. Galerie Ren is a kaleidoscope shop located in the Byakurenbo Temple, Nagano Prefecture. There are many collections of kaleidoscopes made by many designers. You can make your own design kaleidoscope. They have many accessories that can make your original design. You can pick up 2 different styles of kaleidoscopes. Also, you will have a free oil design kaleidoscope. You can make your own natural stones bracelet. You can make your own suncatcher. You will use natural stones and crystal glass.